Coming soon after Sweden's recognition of a non-existent state of Palestine, the British Parliament's 274-to-12 resolution to recognize "Palestine" flags a sea-change in European sentiment towards Israel. France is thinking of following suit. 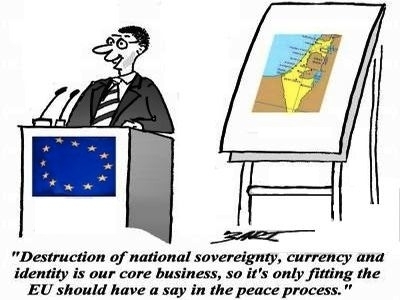 The European Community bureaucracy, meanwhile, has readied sanctions against Israel. One remonstrates in vain. The Gaza War should have taught the world that Israel cannot cede territory to Mahmoud Abbas, now in the 10th year of a 4-year term. Hamas has the support of 55% of West Bank Palestinians vs. just 38% for Abbas, and Hamas openly brags that it could destroy Israel more easily from firing positions in the West Bank. Only the Israeli military keeps Abbas in power; without the Israelis Hamas would displace Abbas in the West Bank as easily as it did in Gaza; and a Hamas government in the West Bank would make war on Israel, with horrifying consequences. To propose immediate Palestinian statehood under these circumstances is psychotic, to call the matter by its right name. The Europeans, along with the United Nations and the Obama administration on most working days, refuse to take reality into account. When someone tells you that Martians are transmitting radio waves into his brain, or that Elvis Presley really is the pope rather than an Argentine Jesuit, one doesn't enquire into the merits of the argument. Rather, one considers the cause of the insanity. The Europeans hate Israel with the passion of derangement. Why? Well, one might argue that the Europeans always have hated Jews; they were sorry they hated Jews for a while after the Holocaust, but they have gotten over that and hate us again. Some analysts used to cite Arab commercial influence in European capitals, but today Egypt and implicitly Saudi Arabia are closer to Jerusalem's point of view than Ramallah's. Large Muslim populations in Europe constitute a pressure group for anti-Israel policies, but that does not explain the utter incapacity of the European elite to absorb the most elementary facts of the situation. The unquiet urge of each nation to be chosen in its own skin began with the first conversion of Europe's pagans; it was embedded in European Christendom at its founding. Christian chroniclers cast the newly-baptized European monarchs in the role of biblical kings, and their nations in the role of the biblical Israel. The first claims to national election came at the crest of the early Dark Ages, from the sixth-century chronicler St Gregory of Tours (538-594), and the seventh-century Iberian churchman St Isidore of Seville. As I observed on the First World War anniversary, Saints Isidore of Seville and Gregory of Tours were in the Bialystock and Bloom of the Dark Ages, the Producers of the European founding: they sold each petty monarch 100% of the show. Europe's nationalisms were not simply an expansion of tribal impulses, but a nationalism refined and shaped by Christianity into a ghastly caricature of Israel's Chosenness. In turn, each European country asserted its status as God's new people: France under Richelieu during the 17th century, England under the Tudors, Russia ("The Third Rome") from the time of Ivan the Terrible, and ultimately the Germans, who substituted the concept of "master race" for the Chosen People. The flowering of Jewish national life in Israel makes the Europeans crazy. It is not simply envy: it is a terrible reminder of the vanity of European national aspirations over the centuries, of the continent's ultimate failure as a civilization. Just as the Europeans (most emphatically the Scandinavians) would prefer to dissolve into the post-national stew of European identity, they demand that Israel do the same. Never mind that Israel lacks the option to do so, and would be destroyed were it to try, for reasons that should be obvious to any casual consumer of news media. Europeans cannot live with their past. They cannot live with their present, and do not plan to have a future, for they do not bear enough children to forestall demographic ruin at the hundred-year horizon. With its high fertility, national spirit, religiosity and unabashed national self-assertion, Israel reminds the Europeans of everything that they are not. Much worse: it reminds them of what they once desired to become. The idea of Israel as well as the fact of Israel are equally intolerable to them. It remains to be seen whether Germany–the one European country that has made a vigorous effort to come to grips with its dreadful past–will allow anti-Israel sentiment to turn into diplomatic isolation. One hopes that Angela Merkel, Germany's talented and well-intentioned chancellor, will stand in the way of this. Europe may not be quite a lost cause for Israel, but it is at grave risk of becoming one. David P. Goldman is Senior Fellow at the London Center for Policy Research and Wax Family Writing Fellow at the Middle East Forum.